Whether for a picnic, everyday family meal, or special dinner, fried chicken is an excellent choice. The typical skillet fried chicken is made with a cut-up broiler-fryer chicken, but feel free to use your favorite parts -- chicken drumsticks, whole legs, thighs, or chicken breasts. Here are some of our favorite preparations, including classic Southern fried chicken, lighter oven-fried versions, fried boneless chicken breasts or cutlets, and fried chicken sandwiches. 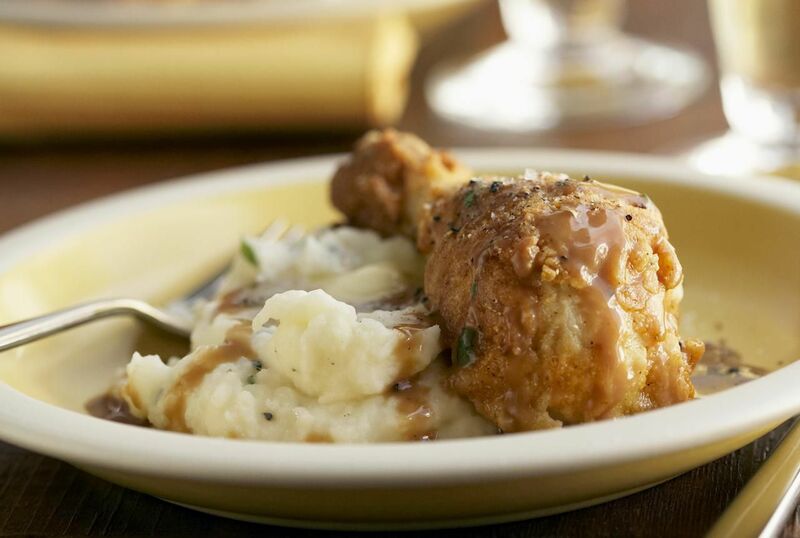 Whether you serve your fried chicken with mashed potatoes, French fries, macaroni and cheese, potato salad, a tossed salad, or steamed vegetables and biscuits, this dish makes for a fabulous family meal. You can't go wrong with fried chicken! 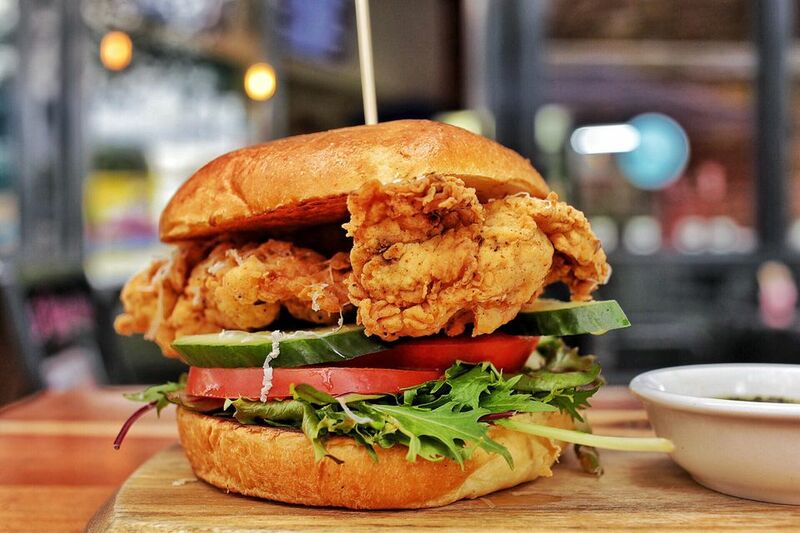 Crispy fried chicken with spicy Sriracha mayo makes incredibly delicious sandwiches. Just serve the chicken on soft buns with lettuce, tomato slice, red onion, and dill pickle slices. These oven-fried chicken thighs start in the skillet. The chicken is fried in a small amount of oil until browned, and then it's baked to golden perfection. Hot sauce and Cajun seasoning flavor these fried chicken cutlets. If you can't find chicken cutlets, slice chicken breasts (average size) horizontally to make the thin cutlets, and then pound them gently to an even thickness. The coating for this fried chicken includes a batter of milk and eggs, and then the chicken is dredged in seasoned flour. Fry the chicken in a cast iron skillet or heavy Dutch oven. These chicken pieces take a dip in milk before tossing with some seasoned flour. Add some bacon drippings to the oil for extra flavor. A sweet and sour honey marinade flavors the chicken pieces in this recipe. The chicken is marinated and then dipped in buttermilk and a crumb mixture. It's a deliciously different alternative! You don't have to use a deep fryer to make delicious crispy chicken. Baking reduces the fat content while the Parmesan cheese, butter, and garlic keep it juicy and flavorful. Buttermilk marinated bone-in chicken breasts are dredged in flour and deep-fried to crispy perfection. Add French fries or mashed potatoes for a fabulous meal for two. These fried boneless chicken breasts can't be beaten! The chicken breasts or cutlets take far less time to cook, and they come out crispy and flavorful. Serve them as an entree or slice the fried chicken and serve atop a Caesar salad. Crushed cornflakes make a tasty, crunchy coating for this chicken recipe. The chicken pieces are brushed with sour cream before they're coated with the crumbs. Use assorted chicken pieces or use all chicken thighs or whole legs. A buttermilk marinade with Creole seasoning flavors these deep-fried chicken tenders. Serve them with fries, in sandwiches, or on waffles. Serve these tender, buttermilk fried boneless chicken breasts on lettuce-lined baguettes or hoagie rolls. These juicy chicken thighs are marinated in buttermilk and then coated with spicy seasoned flour. A buttermilk and hot sauce marinade flavors these yummy chicken breast strips. The marinated chicken is coated with a spicy seasoned flour mixture and deep-fried to perfection. Serve them with your favorite dips. Spicy Asian Sriracha sauce teams up with honey and soy sauce to flavor these Panko-coated chicken fingers. Serve them with an Asian-style dipping sauce. These drumsticks are perfect for a picnic. Add them to your cooler along with potato salad, slaw, and some fresh veggies. Hot pepper jelly and a small amount of Dijon mustard provide depth of flavor to these tasty oven-fried chicken thighs. Crushed stuffing crumbs make up the coating.